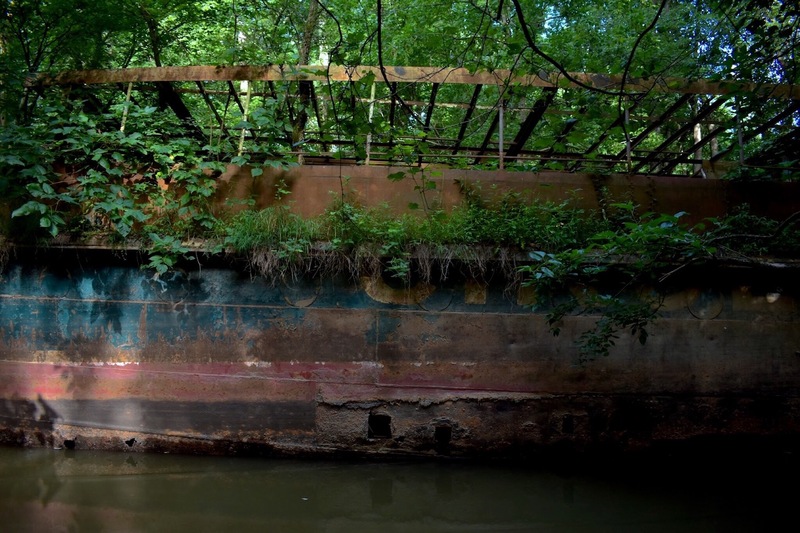 Tucked away, about 25 miles downstream of Cincinnati, rests an abandoned ghost ship. She’s not actually Ohio’s ghost ship, rather she's really Kentucky's Abandoned Ghost Ship. She’s been slowly rusting away in a small creek, just a stone’s throw from Cincinnati. She’s only accessible by hiking across a field and paddling out to see it up close. What’s so amazing is that it’s virtually hidden behind trees, driftwood, and massive reeds. But, there she is, the Celt (though over the years she’s gone by many names). The story behind this abandoned ghost ship is actually quite incredible... She first set sail back in 1902 from Wilmington, Delaware, originally as a luxury yacht, commissioned by a wealthy railroad executive, J. Rogers Maxwell. Maxwell was a passionate yachter, having won the 1907 King’s Cup with his other ship Queen, in a race off Newport against Commodore Vanderbilt. Celt was over 180-feet-long and steam-powered. It was sold to Manton B. Metcalf prior to WWI. During WWI, Celt was renamed USS Sachem, and carried Thomas Edison as a passenger while he conducted government-funded experiments in New York Harbor, when he was head of the Naval Consulting Board. Edison reportedly enjoyed his time aboard the yacht. After WWI the Sachem was sold to Philadelphia banker Roland L. Taylor, and ultimately came into the possession of a Captain Jacob ‘Jake’ Martin, a Brooklynite who used the ship during the Great Depression as a chartered fishing boat. Then, in 1941, the ship went back to the Navy (for a cool $65,000) and used to train soldiers learning to test sonar equipment in Key West Harbor. It was renamed the USS Phenakite. Eventually she patrolled Long Island Sound and was eventually returned to Captain Martin, after the war. Interesting side note about Captain Martin, he’s considered one of the pioneers of party boat fishing. After various owner-changes and several name changes, she’s had quite the adventurous life. After having fought in two World Wars, the Sachem then ferried tourists around New York City for over 40 years (under the name Sightseer and then Circle Line V). And then she was forgotten. For over 30 years. Rusting away in the Ohio River. Today you can see the ship either by paddling up the creek, or via the Ohio River. You can also see it from the road, but it’s worth getting out of your car to experience the full gravity of its sheer abandoned awesomeness. After exploring the ghost ship, head over to Ludlow Bromley Yacht Club. This bar/restaurant is a floating barge out on the river with plenty of of outdoor seating, and tiki-tented tables. There's also corn hole, a makeshift beach, and awesome river views. Then head over to Florence, Kentucky to spend the night in one of the themed rooms at the Wildwood Inn. To top off an exciting life, the ship even had a cameo in Madonna’s “Papa Don’t Preach” music video. Eventually a Cincinnatian bought her and sailed her to the Midwest. According to Queen City Discovery the yacht was purchased by Robert Miller, a resident of Lawrenceburg, KY, in the late ‘80s for the rock-bottom price of $7,500.